The seventh edition of Middle East: What Cinema Can Do is set to unfold in the usual venue in Paris continuing the biennial's intent to inform, create awareness and stimulate dialogue, with a ten-day programme of shorts, mid-length films, feature and documentary films from Egypt, Iraq, Iran, Israel, Lebanon, Libya, Palestine and Syria. Israelis-Palestinians: What Can Cinema Do? was the name of the first two editions of this biennale festival. The first was held from 26 March to 1 April 2003, quickly making its mark as an event not to miss, an event that can be qualified as the only biennale festival in Europe bringing these "enemies" together on the same programme. Founder Janine Halbreich-Euvrard has been a film critic since 1974. That same year she organized - in Royan, France - the first third-world film festival ever held in Europe, already focusing on the Middle East, and of course, the Israeli-Palestinian conflict. She made a visit to the region in 2004, venturing to meet the filmmakers on their own territory. By February of 2005, she had published a book bearing the same name, in which she recounts her journey interspersed with a series of interviews with some of the most prominent filmmakers in the region, including Sobhi Al-Zobaidi, Simone Bitton, Tawfiq Abut Wael, Mai Masri, Ram Loevy, Avi Mograbi, Georges Khleifi…The second edition of the biennale festival took place from 1 to 7 June 2005. In the continuity of this strong beginning, the third edition took place from 21 to 27 November 2007. We recognized the need to widen our approach, for the whole area is implicated in this tragic and endless conflict and that is why the name of the event became Middle East: What Can Cinema Do? Another new element for the 2007 edition was the debate+film daily screening, exploring crucial themes such as the Israeli settlement of Palestinian land, the tragedy of Gaza, that of Lebanon, the war in Iraq and the place of Women in Middle Eastern society. For 2009, marking the festival's fourth edition, many of the themes were revisited in new works by Middle Eastern filmmakers as the region showed no sign of improving. A new focus was added, that of Iran and the growing unrest among the young people. Furthermore, Middle East: What Can Cinema Do? was no longer a film week, but rather ran over 12 days. In 2011, the name changed again: Middle East: What Cinema Can Do, in the affirmative form! And it lasted for two weeks. In view of the Arab Spring developments, it was necessary to add this new theme, marking the inclusion of Egypt for the first time. Held at the cinema Les 3 Luxembourg, art house cinema owners Gérard and Anne Vaugeois played an essential role in hosting the first five editions of the festival. Their dedication to bringing thought-provoking films and filmmakers to meet movie audiences on a regular basis guaranteed that the event and the venue were in perfect symbiosis. In 2013, the cinema theatre changed owners yet the venue remained the same for our biennial. The film event also slimmed down to 10-days and was devoted to Stephane Hessel, who had deceased earlier that year and the youth in the Middle East fighting for their liberty and democracy. Ten years later in 2014, Janine Euvrard, accompanied by co-programmer Carol Shyman, returned to Israel and Palestine. 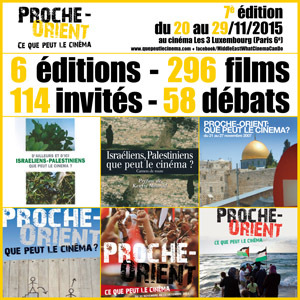 The resulting second edition entitled "Israéliens, Palestiniens: les cinéastes témoignent" (the English edition will come out in 2016) is a very comprehensive look at a politically-charged cinematographic picture of the production in these two territories today, including interviews with Suha Arraf, Annemarie Jacir, Guy Davidi and Nadav Lapid, just to name a few. The book will be released in time for the 7th edition of the festival. The 2015 edition is again a 10-day event being held from 20-29 November at its usual venue, the cinema Les 3 Luxembourg located on the Left Bank in Paris, and is dedicated to our eternal friend Stephane Hessel as well as the plight of refugees in the Middle Eastern region. A selection of films will take us on a tour of several regions in the Middle East even if Israel and Palestine remain at the core of the event. United Nations Relief and Works Agency (UNRWA) and the European Union (EU) hold a photography competition each year, open to all Palestine refugees aged 16-29. A sort of trademark of our biennial event, the debates after the evening film screenings are essential for putting the projected or commonly-held perspectives into the bigger picture, and totally enriching the festival-goer's experience. Never has the Middle East known such chaos: civil wars in Iraq and Syria, warring communities in Yemen, disintegration in Libya, threats of a new Intifada in Israel-Palestine, not to mention confrontation in Afghanistan. Meet the organizers of the event.